Cocoa Research Group Faculty of Agriculture, Hasanuddin University, Makassar 90245, Indonesia. Endophytic Trichoderma inoculated into roots have been known can colonize above ground tissues of cacao. In this study, we evaluated Trichoderma asperellum spread and impact on endophytic fungi occurring naturally in leaf, stem and root tissues after application through foliar spraying, stem infusion, and soil drenching into cacao seedling of two, four, and five months old respectively. This fungus was isolated from all plant tissues, although by stem infusion, it was not detected in leaf tissues, and regulated different co-occurring fungal endophytes influenced by seedling age. Dominant endophytes detected were Fusarium 1 and 3 in seedlings used for foliar spraying, morphospecies 1 and 3, and Lasiodiplodia 1 in seedlings used for stem infusion, and Lasiodiplodia 2, 3 and 4, and Paecilomyces in seedlings used for soil drenching. In general, these dominant fungi were more numerous in tissues of the control than in those that had been inoculated with T. asperellum over three weeks post inoculation, but instead four weeks post inoculation. The pattern was changed in tissues following soil drenching where higher colonization of dominant fungi in treated seedlings began earlier. 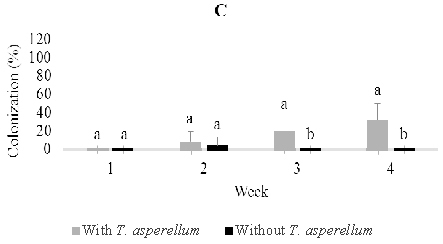 These data showed that T. asperellum can deploy systemically, through the application of foliar spraying, infusion, and soil drenching, to almost all parts of the cacao plant even in the presence of endogenous fungal endophytes and the last fungi their self can reach high colonization in the presence of T. Asperellum. Therefore, this presence together of introduced and co-occurrence of endophyte fungi could potentially be used to develop a method for suppressing cacao pathogens. Keywords: Fungal endophytes, foliar spraying, stem infusion, soil drenching, colonization. Fungi derive their nutrition from a wide diversity of substrates and many of them depend upon plants for growth and reproduction. Endophytic fungi have attracted great attention in the past four decades, usually, infect and live within living plant tissues without causing any manifestation of a disease. They grow within roots, stems and/or leaves, sometimes emerging to sporulate at plant-tissue senescence (Samuels et al. 1979; Stone et al., 2004; Rodriguez et al., 2009). Endophytes have been organized into 4 classes, each defined by the plant tissues it infects, and its transmission. Class 1 endophytes (C-endophytes) are members of the Clavicipitaceae. These infect grasses and are seed-borne, growing from seed into leaves. Class 2-4 endophytes belong to many taxonomic groups except the Clavicipitaceae (NC-endophytes). These are not borne by seed and occur in the majority of plant groups except grasses (Saikkonen et al., 2002; Arnold and Lutzoni, 2007; Rodriguez et al., 2009). Every plant species including cacao, Theobroma cacao, harbors endophytic fungi (Arnold et al., 2000; Herre et al., 2007). In cacao, above ground tissues are endophyte-free at emergence; they accumulate diverse endophytes by aerial infection through fungal spores in the environment. A few species consistently dominate the endophyte early on and after 2-3 weeks more uncommon species are encountered (Arnold et al., 2003; Herre et al., 2005; Mejia et al., 2008). The endophytic assemblage in leaves is dominated by genera such as Colletotrichum, Botryosphaeria, Xylaria, and Phomopsis (Arnold et al., 2003), in branches or twigs dominant genera are Trichoderma, Pestalotiopsis, Fusarium, and Lasiodiplodia (Hanada et al., 2010; Rosmana unpublished data; Rosmana et al., 2013; Rubini et al., 2005), while in trunks the dominant endophytes are species of Clonostachys and Trichoderma (Crozier et al.,2006; Evans et al., 2003). Recent evidence shows also that Class 3 endophytes include fungi that are frequently associated with parasitic or pathogenic lifestyles (Arnold and Engelbrecht, 2007). These fungal endophytes can play important role in host defense (Arnold et al., 2003). Cultures of Trichoderma endophytes of cacao have been known and used in control of diseases such as Phytophthora pod rot (Hanada et al., 2009; Hakkar et al., 2014), witches broom (Samuels et al., 2000), frosty pod rot (Holmes et al., 2004), and vascular streak dieback (Rosmana et al., 2015; Rosmana et al., 2016). Although Trichoderma is considered effective against these diseases, there is no evidence that the fungus spread systemically and maintain the pace of growth in cacao tissues in nature. The co-occurrence of fungal endophytes mentioned above is one factor that could limit the establisment and proliferation of endophytic Trichoderma colonization. If this case is understood, the use of Trichoderma in the field is not necessary a mayor problem because a single inundative application has at least the potential to colonize the entire plant. The divers of application method should be thought with a view to developing more effective and efficient biological control of diseases in cacao. The study used Trichoderma asperellum strain ART-4/G.J.S. 09-1559 from the collection of the Cocoa Research Group, Faculty of Agriculture Hasanuddin University. This fungus was cultured on potato dextrose agar (PDA) in 9 cm diameter Petri dishes for seven days, by which time they had colonized the entire surface of the Petri dishes. Cultures were then flooded with 10 mL of sterile water and the surface was scraped with the spatula. The liquid containing conidia and mycelium was then decanted into 250 mL Erlenmeyer flasks. The flasks were shaken and to separate the mycelium from spore suspension, the contents of the flask were filtered through sterile muslin cloth. Spore concentrations were adjusted to approximately 106spores/mL and these spores were used for inoculation experiments. Cacao beans of MCC 1 clone were germinated in layers moist cloth and those that showed the strongest germination were then planted in poly-bags containing approximately 1.5 kg nonsterile soil. These seedlings were grown in the green house with the temperature range of 27ºC to 32ºC and humidity range of 78% to 90%, to permit infection by fungal spores from the environment. After two, four and five months old, seedlings were inoculated with T. asperellum through respectively foliar spraying, stem infusion, and soil drenching. For foliar spraying, 106spores/mL T. asperellum were suspended in 250 ml sterile water and then sprayed a whole quantity of this suspension using a hand sprayer onto the surface of three until four young leaves in each seedling. Before spraying, the soil surface was covered with plastic to prevent the Trichoderma from entering the plants through soil. In the stem infusion experiment, the same quantity of 250 mL suspension was filled into 1.5 L plastic bottle and by hanging and reversing of this bottle, the suspension infused into each seedling via a small hose attached to a disposable syringe with the needle placed under the bark but above the cambium.The procedure used in this inoculation technique is the same as that used in side grafting: a reverse V-cut was made in the stem by making a triangle incision on the bark begun from the top, but without the horizontal incision. This results in a pocket into which the needle of the syringe can be inserted. Once inserted, the entire site is bound with the fine cord so as to prevent leakage of any of the inoculum. For the soil drenching, 106 spores suspended in 250 mL was just flushed gradually into soil surface around stem of the seedling. 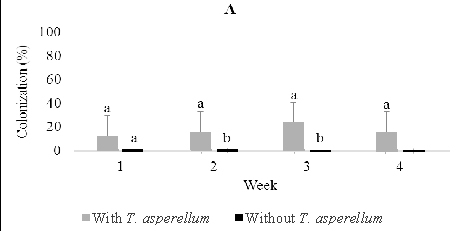 Each experiment consisted of 20 seedlings inoculated with T. asperellum and 20 seedlings as control, which was not inoculated with T. asperellum; therefore, a total of 120 seedlings were used in the three experiments. 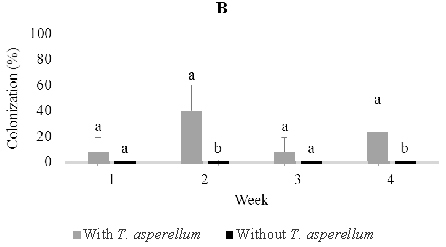 The presence of T. asperellum and its competitiveness with other fungi found in leaf, stem, and root tissues was observed after the first, second, third, and fourth-week post inoculation by sampling five treated and five untreated seedlings. Leaves were cut into 1 x 0.5 cm2 pieces; stems and roots were cut into 1 cm sections after removing their bark. Five pieces of leaves and five sections of stem and roots respectively were sterilized in 0.5% sodium hypochlorite for three minutes, 70% ethanol for two minutes and vigorously washed several times in sterile distilled water before being placed onto PDA in Petri dishes. These Petri dishes were incubated at room temperature and examined every day for the presence of Trichoderma and other fungi. The colonization of Trichoderma and other fungi in cacao seedling tissues was calculated using the formula of C = a/b x 100% where C was colonization percentage, a was the number of pieces or sections containing the fungi and b was the total number of pieces or sections in Petri dishes. The fungi associated with seedling was distinguished based upon the morphological characteristics of their cultures in PDA medium including growth rate, mycelial texture, colony density, colony color both at the upper surface and the lower surface, zonation, and production of pigments. In addition, with the aid of a light microscope, hyphae septation and branching as well as size, shape, or color of conidiophores, phialides and conidia were also observed. This assessment of characteristics were used in taxonomic keys for identification of fungi (Barnett, 1998; Kiffer, 1997). 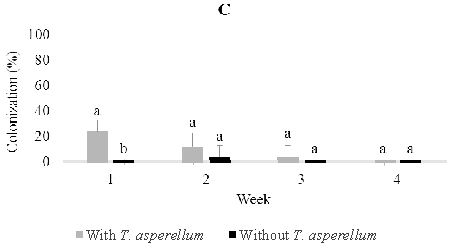 The occurrence of T.asperellum in treated and untreated cacao seedling tissues was analyzed without any transformation. A T-test was then used for evaluating significant differences between means in the two. While for co-occurring dominant fungal endophytes, statistical analysis was not done, because sometimes the number of morphospecies in treated and untreated was different. 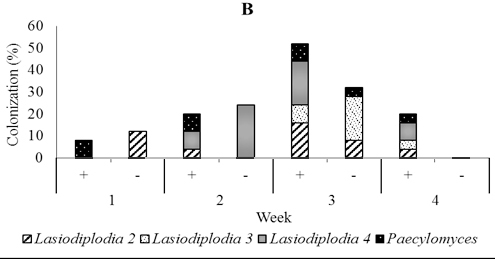 Trichoderma asperellum was reisolated from all inoculated seedlings at all sampling times. In the uninoculated seedlings, Trichoderma was either not detected or occurred at a level that was far below that observed in the inoculated seedlings (Figure 1, 2 and 3). Therefore, we are confident that the Trichoderma that we isolated is the one that was inoculated. 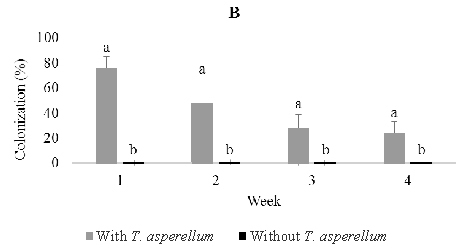 A sampling of seedling tissues weekly over four weeks post-inoculation through foliar spraying showed that T. asperellum was capable of moving rapidly from the site of inoculation to stems and roots of the seedlings (Figure 1). The percentage of colonization dropped over time in each of the tissues and four weeks post-inoculation T. asperellum was isolated from just 4.0% of leaf pieces and 24.0% of the stem pieces; it was not recovered from root pieces (Figure 1). 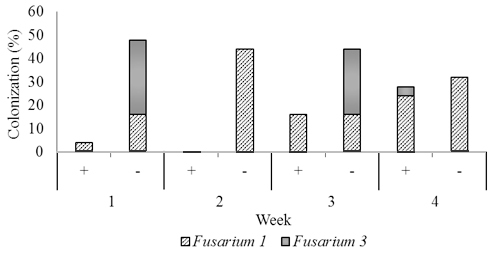 Following stem infusion, isolations were made weekly over four weeks post-inoculation as described above (Figure 2). T. asperellum colonized the stem progressively and moved slowly into roots, but did not rise into leaves. The colonization percentage of stems rose from 36% one week post-inoculation to a maximum of 84% three weeks post inoculation and then fell to 28% after four weeks. On the other hand, colonization of roots increased steadily from 0% one week post-inoculation to a maximum of 32% four-weeks post inoculation. In control seedlings, Trichoderma was observed to colonize 4.0% of stem and 4.0% root tissues one and two weeks post-inoculation. Application of T. asperellum through soil drenching demonstrated that this fungus could reach, penetrate and colonize roots and then rise to colonize stems and leaves, (Figure 3). 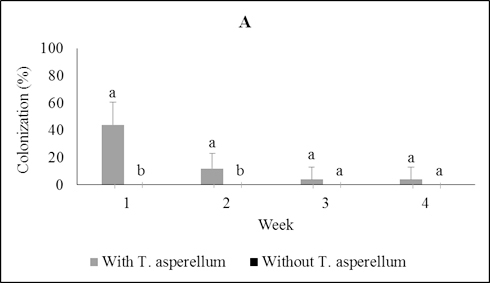 However, there were no clear patterns of recovery of T. asperellum from leaves (12%, 16%, 24%, 16%) and stems (8%, 40%, 8%, 24%), respectively, over four weeks post-inoculation beyond the fact that a certain percentage of these tissues remained colonized by the endophyte. On the other hand, colonization of root pieces reached a maximum one week post-inoculation and remained steady until the percentage colonization dropped four weeks post-inoculation (28%, 24%, 28%, 16% respectively). As with leaves and stems, T. asperellum could always be reisolated from a certain percentage of plants. 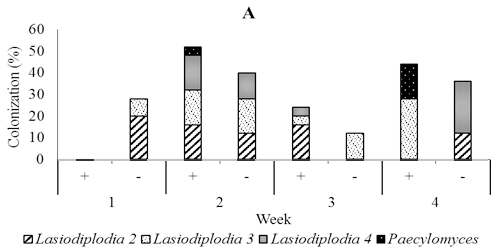 In control seedlings, Trichoderma was found to colonize 4.0% of root tissues three weeks post inoculation (Figure 3). Roots, stems and leaves of the plants that had been inoculated with T. asperellum by the respective methods were sampled for the presence of fungi other than T. asperellum. These fungi were characterized by their morphological and cultural characters and classified into morphospecies on these bases. The occurrence of these fungi in tissues of inoculated seedlings was compared to their occurrence in uninoculated seedlings. These fungi were ambient in the environment in which the cacao seedlings were incubated. Infection of the seedlings by them was incidental. 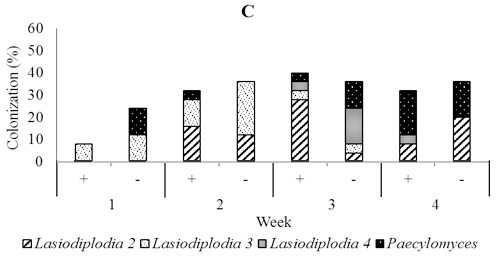 In general incidental dominant fungi were more numerous in tissues of the uninoculated, control seedlings than in those that had been inoculated with T. asperellum over three weeks post-inoculation, but instead four weeks post inoculation (Figure 4 and 5) This pattern was changed in leaves, stems, and roots following soil drenching where higher colonization of dominant fungi in treated seedlings was begun earlier (Figure 6). In two months old seedlings that were inoculated with T. asperellum by foliar spraying, Fusarium1 and 3 were dominant in stems and root and a small numerous in leaves. Others, including Fusarium 2 and 4, and Rhizoctonia were recovered from roots, and Aspergillus was isolated a few times from leaves. 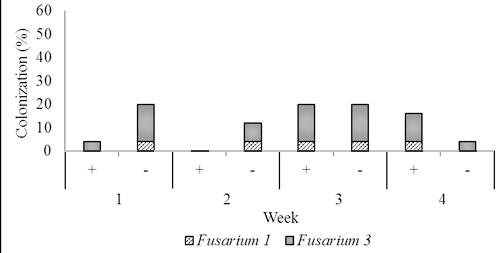 In the presence of T. asperellum, in general colonization of the two dominant Fusarium in the stem and root tissues increased respectively from 4.0% one week post-inoculation to respectively 28.0% and 16.0% four weeks post-inoculation. Contrarily, in the control of same tissues, the colonization of these fungi decreased from respectively 48.0%, and 20.0% one week-post inoculation to respectively 32.0%. and 4.0% four weeks post-inoculation. In five-month-old seedling leaves used for soil drenching, we isolated fungi including Lasidioplidia 2, Lasidioplidia 3, and Lasiodiplodia 4, Paecilomyces, Syncephalastrum, and Aspergillus. The same fungi were also isolated from stems and roots with exception of Aspergillus. However, the most dominant was the first four. In the presence of T. asperellum, these dominant endophytes did not observe to colonize leaf tissues one-week post-inoculation, while in the control, it is observed 28.0% of colonization. Conversely, two, three and four weeks post-inoculation, these endophytes were more numerous in those treated with colonization of 52.0%, 24.0%, and 44.0% respectively than in the control with colonization of 40.0%, 12,0%, and 36.0% respectively. In stem tissues treated, dominant endophytes were less numerous one week and two weeks post-inoculation with colonization of 8.0% and 12.0% respectively than the control with colonization of 12.0% and 44.0% respectively, while to the contrary three and four weeks post-inoculation the dominant endophytes were numerous in those treated with colonization of 52.0% and 20.0% respectively than the control with colonization of 32.0% and 0.0% respectively. The dominant endophytes in root tissues treated were just observed numerously three weeks post-inoculation with the colonization of 40.0% compared to 36.0% in control (Figure 6). The results presented here demonstrate the ability of an endophytic culture T asperellum to spread quickly from its point of inoculation in the leaf, vascular cambium and root to all other parts of cacao seedlings. Previous studies showed also that Trichoderma can be re-isolated as the endophyte from all seedling tissues, but in general after application through seeds and roots under gnotobiotic conditions (Bailey et al. 2006; Bailey et al. 2008; Rosmana et al., 2015). Our trial was made in an unsterilized environment in a green house but the control seedlings typically were not infected with any Trichoderma. Our results indicate that horizontal transmission is not important in the spread of Trichoderma endophytes. Association of Trichoderma with root systems has been extensively studied and is well characterized (Harman, 2000; Harman et al., 2004). An intense study of root colonization by T.asperellum T-203 showed their hyphae curl around root hairs and form swellings similar to appressoria (Yedidia et al., 2000). In early attachment, hydrophobin proteins are involved and then swolenin protein plays a role in loosening the root cell wall by expanding cellulose fibers, therefore extenuating the action of a vast arsenal of cell wall degrading cellulases (Brotman et al.,2008; Yedidia et al., 2000) and finally, intercellular penetration to a depth of a few cells into the root cortex (Harman et al., 2004). However, few studies have considered the interaction between Trichoderma and aerial parts of plants. Many studies show that Trichoderma is found in leaves, pods, branches, and stem bark (e.g., Hanada et al., 2010; Rosmana et al., 2015; Rubini et al., 2005). However, the mechanism by which Trichoderma enters plants through their aerial parts remains a mystery. Indeed, plant defenses such as the cuticle that covers the surface of leaves, including their stomata, hidatode, and trichomes, can inhibit penetration by Trichoderma. Rabdocline parkeri, an endophyte of douglas fir, produces fine penetration hyphae that penetrate the surface of healthy leaves (Stone, 1988), while Cladosporium cladosporioides and Alternaria alternata, endophytes of Juncus spp., infect leaves through stomata (Cabral et al., 1993). One study has shown that a Trichoderma can colonize glandular trichomes and form swellings resembling appressoria (Bailey et al., 2009), indicating the fungus can probably penetrate them. In this research, we sprayed T. asperellum onto young leaves where the trichomes were still abundant. Trichoderma may also be able to penetrate the stem surface. It has been suggested that Trichoderma penetrates the stem through the thin periderm, lenticels, leaf scars or scars of bud scales (Baum et al., 2003; Ouellette et al., 1995; Stone, 1987) and also stem trichomes (Bailey et al., 2009). But here, we inoculated T. asperellum through infusion directly into the vascular cambium, making it easier for the Trichoderma to penetrate into the plant. Trichoderma harzianum is capable of penetrating the wood of grapevines from treated pruning wounds (Harvey and Hunt, 2006). When Trichoderma was inoculated through the soil, this fungus could be re-isolated from xylem, bark, apical meristem, stem trichomes, and to a lesser degree from leaves (Bailey et al., 2008; Bailey et al., 2009).This indicates that Trichoderma can spread from roots to other parts of cacao tissues through the xylem. We always found T. asperellum not only in roots but also in stems and leaves from the first week to the fourth-week post-inoculation through soil drenching. Therefore, our finding support xylem as being the facilitator of long distance spread of Trichoderma. 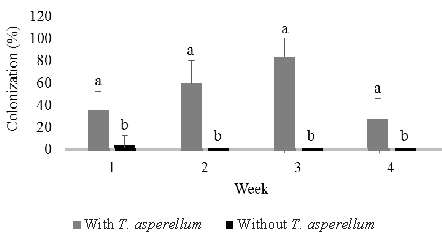 When we applied T. asperellum through foliar spraying, we found it also in leaves, stems, and roots, but colonization tended to decrease with the time and even four weeks post infection Trichoderma was found in leaves but no longer in roots. This demonstrates that Trichoderma can descend from leaves to roots, probably through the phloem. When we inoculated with T. asperellum into the vascular cambium through stem infusion, we found it only in the stems and roots but not leaves, suggesting its spread through the vascular cambium or phloem. At emergence from seed, cacao tissues are endophyte-free. They are subsequently contaminated by diverse endophytes from spore sources in the environment. Within two until three weeks a few species that are consistently dominant members of the assemblage heavily colonize the leaves and they are joined a larger number of exceedingly rare fungi (Arnold et al., 2003; Herre et al., 2005; Mejia et al., 2008). Our results support these findings by showing that endophytic fungi from the two-month-old cacao seedlings that were used for foliar spraying of Trichoderma were dominated by Fusarium1 and 3, which colonized stems and roots. While, the endophytic fungi isolated from four-month-old cacao seedlings that had been inoculated through the vascular cambium were dominated by Lasiodiplodia 1 and two unidentified fungi in leaves, stems, and roots.The endophytes found in five month old seedlings that were inoculated with T. asperellum through soil drenching were dominated by Lasiodiplodia 2, 3, and 4, and Paecilomyces and colonizing leaves stems and roots. Trichoderma asperellum did not limit seedling tissue colonization by all dominant endophytic fungi mentioned above. In general, they were less numerous at the inial phase of Trichoderma presence and turned to become more numerous colonization than the control at next phase of up to four weeks (Figure 4 and 5). 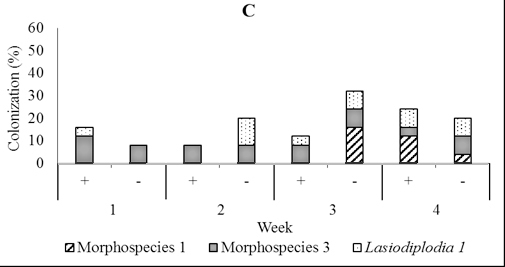 Moreover, when the number of dominant endophytes increased in five-month-old seedlings, we observed markedly the more numerous colonization especially in leaf and stem tissues treated than in untreated one (Figure 6). It is apparently that Trichoderma could enhance them to colonize seedling tissues. With this fact, we suggest that in cacao disease suppression, T. asperellum can jointly to make a consortium with dominant fungal endophyte present in certain period of cacao development phase. Fusarium species are very diverse in cacao, and many studies show that fungus can serve as a control agent of cacao diseases (Arnold et al., 2003; Hanada et al., 2010). While, no report concerning the use of Lasiodiplodia for controlling the disease on cacao and so far six morphospecies have been found (A. Asman, unpublished data). Paecilomyces have also known can inhibit Phytophthora palmivora, the causal agent of Phytophthora pod rot on cacao (Adebola and Amadi, 2010). Some species of Fusarium and Lasiodiplodia can cause disease on cacao such as dieback (Adu-Acheampong, 2011, del Castillo et al., 2016, Rosmana et al., 2013), but the disease is just expressed in stress conditions (Burgess and Bryden, 2012; Müllen et al., 1991; Rosmana et al., 2013). Therefore, their presence if any in assemblage will support apparently to compete with the major pathogen. 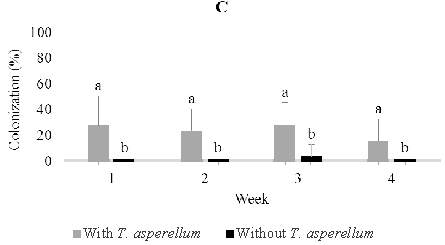 Even in the presence of endophytic fungi mentioned above, T. asperellum was able to consistently colonize over four weeks the seedling leaves, stems, and roots, especially following soil drenching. The ability of Trichoderma to colonize roots has been used as a selectable trait (Harman et al., 2004). However, its presence at the same time in leaves and stems would offer localized effects either via direct pathogen inhibition or via localized induction of host defensive pathways (Aneja et al., 2006, Bailey et al.,2006), therefore Trichoderma would be capable of reducing cacao diseases, most of which act on above-ground tissues. In addition, the capacity to regulate co-occurrence dominant fungal endophytes, it would reinforce Trichoderma for more persistent in the suppression of the diseases. We conclude that Trichoderma asperellum can be applied through foliar spraying, stem infusion, soil drenching. These three methods can be used as an option and can be adapted according to age and phase development of cacao for efficiency. Colonization of this fungus in leaves, stems, and roots did not cause a shift, but more to a regulation in the colonization of fungal endophyte community and this could potentially be used to develop a method in crop management. The authors are grateful to Dr. Gary J Samuels for important comments and critical review of the manuscript. The work was funded by Ford Foundation and World Cocoa Foundation. Adebola, M.O., Amadi, J.E. Antagonistic activities of Paecilomyces and Rhizopus species against the cocoa black pod pathogen (Phytophthora palmivora). African Sci., 2010; 11: 235-239. 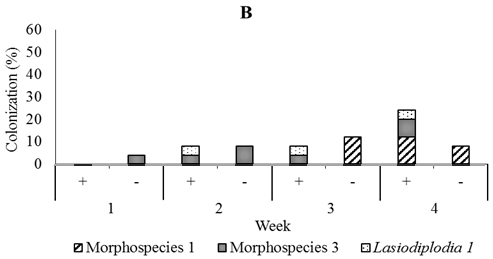 Adu-Acheampong, R., Archer, S. Diversity of fungi associated with mirid (Hemiptera: Miridae) feeding lesions and dieback disease of cocoa in Ghana. Int. J. Agric. Res., 2011; 6: 660-672. Aneja, M., Gianfagna, T., Hebbar, P. Trichoderma produces nonanoic acid, an inhibitor of spore germination and mycelial growth of two cacao pathogens. Physiol. and Mol. Plant Pathol., 2006; 67: 304–307. Arnold, A.E., Maynard, Z., Gilbert, G.S., Coley, P.D., Kursar, T.A. Are tropical fungal endophytes hyperdiverse?. Ecol. Lett., 2000; 3: 267–274. Arnold, A.E., Mejía, L.C., Kyllo, D., Rojas, E.I., Maynard, Z., Robbins, N., Herre, E.A. Fungal endophytes limit pathogen damage in a tropical tree. Proc. Nat. Acad. Sci. USA., 2003; 100: 15649–15654. Arnold, A.E., Lutzoni, F. Diversity and host range of foliar fungal endophytes: are tropical leaves biodiversity hotspots?. Ecology, 2007; 88:541–549. Arnold, A.E., Engelbrecht, B.M.J. Fungal endophytes double minimum leaf conductance in seedlings of a tropical tree. J. Trop. Ecol., 2007; 23: 369–372. Bailey, B.A., Bae, H., Strem, MD., Roberts, D.P., Thomas, S.E., Crozier, J., Samuels, G.J., Choi, I-Y., Holmes, K.A. Fungal and plant gene expression during the colonization of cacao seedlings by endophytic isolates of four Trichoderma species. Planta, 2006; 224: 1449–1464. Bailey, B.A., Bae, H., Strem, M.D., Crozier, J., Thomas, S.E., Samuels, G.J., Vinyard, B.T., Holmes, K.A. Antibiosis, mycoparasitism, and colonization success for endophytic Trichoderma isolates with biological control potential in Theobroma cacao. Biol. Control, 2008; 46: 24–35. Bailey, B.A., Strem, M.D.Wood, D. Trichoderma species form endophytic associations withinTheobroma cacao trichomes. Mycol. Res., 2009; 113: 1365-1376. Baum, S., Sieber, T.N., Schwarze, F.W.M.R., Fink, S. Latent infections of Fomes fomentarius in the xylem of European beech (Fagus sylvatica). Mycol. Progress, 2003; 2: 141-148. Brotman, Y., Briff, E., Viterbo, A., Chet, I. Role of swollenin, an expansin-like protein from Trichoderma, in plant root colonization. Plant Physiol., 2008; 147: 779-789. Burgess, L.W., Bryden, W.L. Fusarium: a ubiquitous fungus of global significance. Microbiology Australia, March Ed., 2012; pp 22-25. Cabral, D., Stone, J.K., Carroll, G.C. The internal mycobiota of Juncus spp. Microscopic and cultural observations of infection patterns. Mycol. Res., 1993; 97: 367-376. Crozier, J., Thomas, S.E., Aime, M.C., Evans, H.C., Holmes, K.A. Molecular characterization of fungal endophytic morphospecies isolated from stems and pods of Theobroma cacao. Plant Pathology, 2006; 55: 783–791. del Castillo, D.S., Parra, D., Noceda, C., Pérez-Martínez, S. Co-occurrence of pathogenic and non-pathogenic Fusarium decemcellulare and Lasiodiplodia theobromae isolates incushion galls disease of cacao (Theobroma cacao L.). J. Plant Protect. Res., 2016; 56: 129-138. Hakkar, A.A., Rosmana, A., Rahim, M.D. Control of Phytophthora pod rot disease on cacao using endophytic fungi Trichoderma asperellum. J. Fitopatol. Indonesia, 2014; 11: 139-144. Hanada, R.E, Pomella, A.W.V., Soberanis, W., Leandro, L., Loguercio, L.L., Pereira, J.O. Biocontrol potential of Trichoderma martiale against the black-pod disease (Phytophthora palmivora) of cacao. Biol. Control, 2009; 50:143–149. Hanada, R.E., Pomella, A.W.V., Costa, H.S., Bezerra, J.L., Loguercio, L.L., Pereira, J.O. Endophytic fungal diversity in Theobroma cacao (cacao) and T. grandiflorum (cupuacu) trees and their potential for growth promotion and biocontrol of black-pod disease. Fungal Biol., 2010; 114: 901-910. Harman, G.E. Myths and dogmas of biocontrol. Changes in perceptions derived from research on Trichoderma harzianumT-22. Plant Disease, 2000; 84:377-93. Harman, G.E., Howell, C.R., Viterbo, A., Chet, I. Trichoderma spp.––opportunistic avirulent plant symbionts. Nature Rev., 2004; 2: 43–56. Harvey, I.C., Hunt, J.S. Penetration of Trichoderma harzianum into grapevine wood from treated pruning wounds.New Zealand Plant Protect., 2006; 59:343-347. Herre, E.A., Van Bael, S.A., Maynard, Z., Robbins, N., Bischoff, J., Arnold, A.E., Rojas, E., Mejı´a, L.C., Cordero, R.A., Woodward, C., Kyllo, D.A. Tropical plants as chimera: some implications of foliar endophytic fungi for the study of host plant defense, physiology,and genetics. In: Burslem DFRP, Pinard MA, Hartley SE (Eds. ), Biotic Interactions in the Tropics: Their Role in the Maintenance of Species Diversity. Cambridge University Press, 2005; pp 226–237. Holmes, K.A., Schroers, H-J., Thomas, S.E., Evans, H.C., Samuels, G.J. Taxonomy and biocontrol potential of a new species of Trichoderma from the Amazon basin in South America. Mycol. Progress, 2004; 3: 199–210. Kiffer, E., Morelet, M. The Deuteromycetes. Mitosporic Fungi: classification and generic keys. Science Publishers Inc, Enfield, USA, 1997. Mejía, L.C., Rojas, E.I., Maynard, Z., Van Bael, S., Arnold, A.E., Hebbar, P., Samuels, G.J., Robbins, N., Herre, E.A. Endophytic fungi as biocontrol agents of Theobroma cacao pathogens. Biol. Control, 2008; 46: 4-14. Müllen, J. M., Gilliam, C. H., Hagen, A. K., Morgan Jones, G. Lasiodiplodia theobromae cancer of dogwood, a disease influenced by drought stress or cultivar selection. Plant Disease, 1991; 75: 886–889. Ouellette, G.B, Methot, N., Champerland, H., Cote, C., Lafontaine, J-G. Cytology of irregular growth forms of Ophiostoma ulmi and Ophiostoma novo-ulmi growing through millipore filter membranes and sterilized elm wood sections. Can. J. Microbiol., 1995; 41: 1095–1110. Rodriguez, R.J., White, Jr.J.F., Arnold, A.E., Redman, R.S. Fungal endophytes: diversity and functional roles. New Phytologist, 2009; 1-17. Rosmana, A., Hikmawati, Zulfikar, M., Asman, Fadillah, D. Identification of a disease on cocoa caused by Fusarium in Sulawesi. Pelita Perkebunan, 2013; 29: 210-219. Rosmana, A., Samuels, G.J., Ismaiel, A., Ibrahim, E.S., Chaverri, P., Herawati, Y., Asman, A. Trichoderma asperellum: a dominant endophyte species in cacao grown in Sulawesi with potential for controlling vascular streak dieback disease. Trop. Plant Pathol., 2015; 40: 19-25. Rosmana, A., Nasaruddin, N., Hendarto, H., Hakkar, A.A., Agriansyah, N. Endophytic association of Trichoderma asperellum within Theobroma cacao suppresses vascular streak dieback incidence and promotes side graft growth. Mycobiology, 2016; 44: 180-186. Rubini, M.R., Silva-Ribeiro, R.T., Pomella, A.W.V., Maki, C.S., Araújo, W.L., dos Santos, D.R., Azevedo, J.L. Diversity of endophytic fungal community of cacao (Theobroma cacao L.) and biological control of Crinipellis perniciosa, causal agent of witches’ broom disease. Int. J. Biol. Sci., 2005; 1:24-33. Saikkonen, K., Ion, D., Gyllenberg, M. The persistence of vertically transmitted fungi in grass metapopulations. Proc. 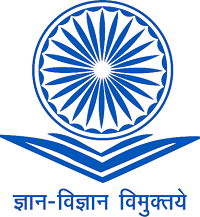 Royal Soc, B: Biological Sci., 2002; 269: 1397–1403. Samuels, G.J., Pardo-Schultheiss, R.A., Hebbar, K.P., Lumsden, R.D., Bastos, C.N., Costa, J.C., Bezerra, J.L. Trichoderma stromaticum sp. nov., a parasite of the cacao witches broom pathogen. Mycol. Res., 2000; 104: 760–764. Stone, J.K. Initiation and development of latent infections by Rhabdocline parkeri on Douglas-fir. Can. J. Botany, 1987; 65: 2614–2621. Stone, J.K. Fine structure of latent infections by Rabdocline parkeri on Douglas-fir, which observations on uninfected epidermal cells. Can. J. Botany, 1988; 66: 45-54. Stone, J.K., Polishook, J.D, White, J.R.J. Endophytic fungi. In: Mueller G,Bills GF, Foster MS, eds. Biodiversity of fungi: inventory and monitoring methods. Burlington, MA, USA: Elsevier. 2004; pp 241–270. Yedidia, I., Benhamou, N., Kapulnik, Y., Chet, I. Induction and accumulation of PR protein activity during early stages of root colonization by the mycoparasite Trichoderma harzianum strain T-203. Plant Physiol. Biochem., 2000; 38:863–873.